Meet our Investors Group Walk for Alzheimer's Victoria honouree: Jeff Woodburn | Alzheimer Society of B.C. 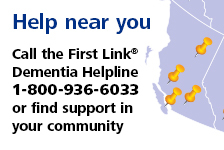 Jeff Woodburn has been active with the Alzheimer Society of B.C. since the mid-‘90s – long enough to witness changes to the organization’s structure, as well as how dementia is viewed in society. Jeff has been instrumental in the Alzheimer Society of B.C.’s organizational success on the Island since he began volunteering in 1996. He joined the board of directors after he was initially contacted to join the local executive and then the board of directors after his father had been diagnosed with Alzheimer’s disease. Jeff played a key role in establishing what is now the Investors Group Walk for Alzheimer’s in Victoria and went on to chair the committee for the Victoria Breakfast to Remember fundraiser. Over the years, Jeff saw the demand for services rise along with the Society’s growth. Thanks to administrative leadership, coordinated volunteer efforts and strong support from the Province, he says, the Alzheimer Society of B.C. has entered a new era. It’s one of critical awareness campaigns and the enabling of exciting research. While Jeff’s involvement with the Alzheimer Society of B.C. has evolved from his official volunteer roles to one of advocacy and stewardship with donors, he remains in touch with why the Society is his charity of choice. Walk with Jeff at the Victoria Investors Group Walk for Alzheimer's on Sunday, May 6. Together, we make memories matter.